Great artists have a way to make even their lesser works interesting, if not great. 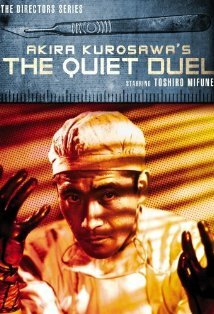 Such is the case with the 1949 black and white film, The Quiet Duel (Shizukanaru Ketto) from Akira Kurosawa, which was based on a play by Kazuo Kikuta, and adapted by Senkichi Taniguchi. At 95 minutes long, this melodrama is not long enough to get on one’s nerves, and just good enough to make a number of its moments stick in memory. The key word about the film, though, is melodrama, and for those accustomed to his greater later works, that may seem a bit of a shock. Yet, there is nothing wrong with melodrama, per se, if it’s done well enough, and this film is. There are moments of soliloquizing that go overboard, but the film’s genuine moments counterbalance that, and ultimately outweigh the flaws. Toshir? Mifune stars as a young doctor named Kyoju Fujisaki, who is serving in a military MASH-type hospital during the Japanese Pacific War, in 1944. During a rainstorm, in the jungle, he accidentally picks up a scalpel by its sharp end and cuts himself. His blood mixes with his patient’s, and he soon finds out he has contracted syphilis from the soldier. Flashforward two years, and he is back in the ruins of Japan, serving at his offices of his father (Takashi Shimura), an obstetrician and gynecologist. The set for this office is almost identical to the prior film Kurosawa made with Mifune and Shimura, who played a doctor in it: Drunken Angel. He has secretly been pilfering Salvarsan, a medicine to treat syphilis. Yet, despite getting the disease in a noble way, Kyoji is ashamed. No one knows why he has changed his personality, least of all his insecure and clingy fiancée, Misao (Miki Sanjo), who vows to never leave his side, despite his breaking off their engagement, after six years. The two nurses at the clinic, Miss Minegishi (Noriko Sengoku) and Miss Imai (Hiroko Machida) think Kyoji is weird. Imai desires to leave nursing as a life, while Minegishi is pregnant, with no husband, and was saved from suicide by Kyoji. She resents his do-gooderness, and openly speaks of wishing she had had an abortion (recall, this is the 1940s). The analogies to the AIDS epidemic of the late 20th Century are obvious, but one cannot help to snicker a bit at the overblown approach Kyoji takes. He will not marry Misao, to protect her from the virus and wasting her life on him, since it will be years before he is cured (ever heard of a condom, doc? ), and he fears she is so kind that she would vow to stay with him through it all. But then he rages in jealousy when Misao finally decides to marry another man, but gives him a last opportunity to dissuade her (he doesn’t). Meanwhile, after Imai quits, Minegishi becomes the head nurse, and has fallen in love with Kyoji, after spying on him and learning the secret of his disease, and its origin. There are a number of overblown emotional scenes (after all, it is a melodrama), and Mifune does exceptionally well in most of them, which brings a bit of depth to his otherwise nauseatingly saintly role; although, the nation of Japan, at the time, turned culturally very conservative after the excesses of the war years. The film ends with the re-entry into Kyoji’s life of the soldier, Nakata (Kenjiro Uemura) whose blood infected him. He has returned home, married and impregnated a woman, but the baby turns out to be stillborn, due to the syphilis. The wife (Chieko Nakakita) is helped by Minegishi, into thinking she still has a future, while the soldier descends into insanity and drunkenness. Kyoji, however, soldiers on at his father’s clinic, helping those less fortunate than he is, all the while being lovingly coveted by Minegishi. The film ends with a montage of heroic doctorly moments from the career of Kyoji, the celibate superdoctor. The film opens with the doctor being calmly infected, and it ends with the calm routine of his life. The DVD, put out by BCI Eclipse, a company which usually specializes in junk television fare, is surprisingly good. There is no audio commentary track, but there is the original theatrical trailer. Unfortunately, the company uses the same type of hard to read subtitles that The Criterion Collection does - white without any borders. It’s bad enough when no English dubbed audio track is presented, but to have poor subtitles. And don’t give me that subtitles are better than dubbing nonsense. Subtitles always lessen the emotional impact of a scene (which does not happen with a good vocal dub actor), for the viewer is forced to read, not watch and listen, they cover up to a third of the screen, and there is far more lost, in terms of untranslated banter, than in dubbed tracks, which conform to the length the characters are speaking. In short, the arguments against dubbing are bogus, because all the claims against dubbing equally apply to subtitles, but subtitles offer none of the benefits dubbing does- such as enjoying the film in as close to the same condition as the original. The film quality is solid, at best, and so is the audio track. There is no restoration work done, and the film is shown in a 1:33:1 aspect ratio; but there are some interesting bonus features. The first is a newsreel about the Daiei Studio’s film stars meeting the baseball team they sponsor. One of the interesting bits of trivia about this film is that it was not made by Toho, the studio that Kurosawa worked with for decades. The other major feature, other than an insert booklet with an essay by film critic Stuart Galbraith IV, is a 45 minute long set of three interviews with principals in the film. Cinematographer Setsuo Kobayashi (an assistant on this film- the lead cinematographer was Shoichi Aizaka) and composer Akira Ifukube give some insights into the film, and their contributions, visually and aurally, are well done. But the highlight of the feature is the interview with actress Miki Sanjo, who describes how she worked both in films and the company’s accounting department, before finally deciding she wanted to act. An interesting anecdote she relates has to do with her getting Kurosawa upset when, on a few days off, she married and went on a honeymoon, thereby causing a slight delay in the production schedule. Even though she had studio permission, it’s interesting to here the old woman state that, if she could do it again, she would postpone her wedding, for Kurosawa’s work was more important than it. Talk about devotion to the arts! The film’s black and white morality play, set in an almost junior high school venereal disease film setting, inspires some unexpected laughs, such as when a boy, suffering from an appendicitis, is told he needs to pass gas before he will know if the operation is successful. The boy asks what passing gas means, and others tell him it means to fart. Later, his whole room cheers when he farts. Such antics are obvious nods to the familial comedies of Yasujiro Ozu. The film’s title is an obvious play off the duel between the two sides of Kyoji- his lustful selfish side, and his noble, selfless one, although, in watching the film, the title could equally apply to the film’s most compelling character, Minegishi, one of the more interesting female characters in the Kurosawa canon (Sengoku’s performance is actually the best in the film). She too battles her immaturity and selfish impulses to become a better person. By film’s end, it is apparent that her better side has won. So, too, has the better side of Kyoji. The Quiet Duel is an interesting film with good moments, from a great artist. It’s not the sort of film that will stay with you for a long time, but it one that you should spend a brief time with.